Anderson Cooper's Twitter account sent out a tweet this morning in a reply to President Trump. The got almost 20,000 likes and was retweeted thousands of times. But, Cooper says that he never sent the tweet. He tweeted this later this morning. But, his claim that his account was hacked was not nearly as popular as the "fake" tweet. 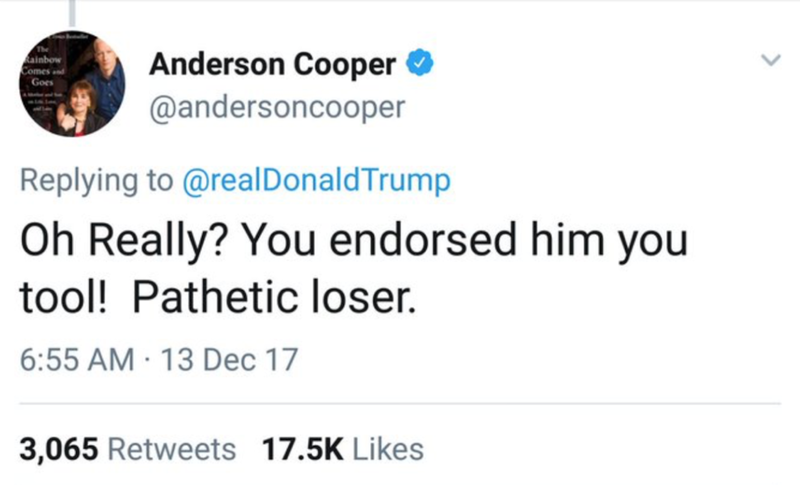 Some even called the tweet that Cooper said he did not send as his best tweet ever. Many aren't buying the fact that Cooper's Twitter was hacked to send just this single tweet. Most often when someone's account is hacked there is a string of tweets and not just one. Maybe Cooper said what he REALLY thought and then thought better of it. Or maybe, just maybe, it was Jeff Zucker.